Since we started using the CMAC videolaryngoscope we have been collecting useful airway videos for education. You can find these videos on this page. We’ll be adding to this page regularly so check back for new videos. The first (very short!) shows soot, on the face as the CMAC is inserted and on the cords at laryngoscopy. The second shows very mildly sooty snot in the airway of a patient with 35% TBSA burns just before the epiglottis is visualised. Sooty snot on nose-blowing was part of the rationale for intubation in this patient. This video shows the appearance of a single (right sided) NPA during passage of the CMAC laryngoscope through the oropharynx. This video shows the appearance of bilateral NPAs during passage of the CMAC laryngoscope through the oropharynx. This video shows the appearance of a denture plate during passage of the CMAC laryngoscope through the oropharynx. This is not secured and should be removed; it’s easy to see how it could cause a complete airway obstruction. Blood in airway + CPR = no CMAC view! In this video, the presence of blood in the airway in combination with the use of the LUCAS device to provide CPR means that the view is totally lost when the blood hits the camera. It can be hard to differentiate oesophagus from trachea at laryngoscopy. This short video shows some friable and hard to identify structures. The hole that eventually appears has the typical appearance of the oesophagus – the trachea is not seen until the final seconds. This short video shows the appearance of a nasogastric tube at laryngoscopy. This video demonstrates how a dried tongue can hamper laryngoscopy attempts by sticking to the laryngoscope. Gently moving the blade forward should get you the view you are looking for. This video nicely shows how suction and external laryngeal manipulation (ELM) can improve your view to facilitate intubation. Severely soiled pharynx and trachea at laryngoscopy. Note soiling distal to the vocal cords and the absence of a gastric tube at this point. This video shows how adjusting the position of the tip of the laryngoscope in the vallecula can improve your view at laryngoscopy. This video shows how we can sometimes use our Mac blade as a Miller blade by picking up the epiglottis: you may not have intended to pick up the epiglottis but if you get a good view as the one shown here, you might decide to proceed with passing the bougie or ETT rather than trying to get into the vallecula (especially as the earlier part of the video shows this might have been challenging). This video appears to show a mass below the epiglottis when the laryngoscope is in the vallecula. This is, in fact, a normal variant – an epiglottic tubercle (see this anatomy diagram from this site). In this video, the epiglottis appears swollen (this may be a result of local trauma caused by the use of an oropharyngeal airway or related to drug use). You can also see an issue with control of the coude (curved) tip of the bougie. This occurs because of the way we transport the bougie in our airway packs: we cannot transport the bougie without bending it and this case reminds us to ensure that the bending occurs along the plane of the coude tip curve during our pack checks. This patient has been exposed to flames – note sooty secretions and swollen arytenoids/posterior glottic structures. We can see the blue bougie passes the cords but following that there is resistance to further advancement – seen as the glottis being moved by attempts to advance the bougie. The intubator removes the blue bougie and uses the white bougie which is less curved. Problem: the coudé tip is likely impacting on the tracheal cartilages of the anterior tracheal wall. (This is more common with hyperangulated video laryngoscopy but occurs here with a Mac shaped blade). Solutions: the bougie could be rotated (twisted) to disimpact the coudé tip from the anterior wall, reshaped to lessen the curve, or exchanged for a straighter bougie as was done here. This video is a great example of how the oesophageal inlet can look so like a trachea – re-emphasising the need to see arytenoids cartilages to positively identify the trachea. We use Parker Flex-TipR‘GlideRiteTM’ tracheal tubes to reduce the potential for the leading edge of the endotracheal tube to ‘catch’ on glottic structures while railroading over a bougie, as is classically described for the arytenoid cartilages. This video shows the gap that can exist between bougie and ETT tip that could lead to ‘catch’ (risking failure to advance and laryngeal trauma). Patients who have been breathing non-humidified O2 for some time prior to intubation can have very dry mucosa in their oral cavity on airway assessment. Lubricating the blade can make the laryngoscopy much easier. Gel is seen on the blade in this video. Initial attempts to intubate this patient were made using direct laryngoscopy during which the operator struggled to identify the inter-arytenoid notch landmark. The intubator proceeded to use the video screen, giving them a clearer view of the glottis and allowing placement of the bougie. It became evident that a sputum plug was obscuring the inter-arytenoid notch landmark that the operator had been trying to visualise. Having the back-up of video laryngoscopy on this Mac 4 blade intubation was very useful. There are significant facial injuries. A gloved hand just visible providing good mouth opening – note how despite facial injuries, the larynx is quite identifiable and not flooded with blood. 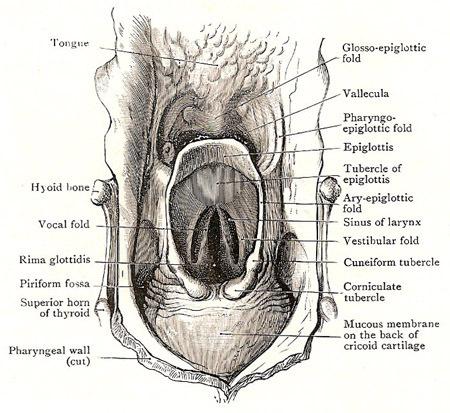 Clear secretions fill the NPA, which is visible in the pharynx. During this intubation, it was noted by the team member watching the screen (VL) that the approach of the white bougie caused a significant change in the screen image brightness, which dulled the view of the larynx in the background by comparison. See also video below. The same patient as in the video above; the blue bougie had much less effect and the view of the larynx was maintained, allowing intubation. CMAC 4 blade used for intubation of a toddler (age approx 18/12). A patient was intubated uneventfully, but the team noted the ETT was sitting at 18cm to lips. Concerned about the ETT being too short, they repeated laryngoscopy and saw this. An adult male had a low GCS and was initially managed by lateral positioning, nasopharyngeal airway and a nasogastric tube. He was intubated for transfer. At laryngoscopy the team got a surprise; the NGT was seen coiled in the pharynx. His nasopharyngeal airway is also seen in this video.